An old butchers' shop, located behind a busy bus stop and nestled between an off-licence and Thai restaurant in Nottingham now stands as a 'shrine' to the Englishman credited with founding AC Milan. Herbert Kilpin, born in 1870 at the back of his father's store at 191 Mansfield Road, went to work in Italy in the 1890s and later established the Milan Football and Cricket Club. The shop front is now painted in AC Milan's famous red and black colours, the club's logo adorns the window, a mural of the man decorates the rear wall inside and a plaque has been attached to the building to honour his memory. While a host of buses pull up at the doorstep of this most unusual piece of Italian history in the East Midlands, there are a number of other obscure English links to foreign football giants that are much more hidden. Did you know the colours of El Clasico, arguably the greatest club rivalry in world football, originate in England? What about the story of the non-league club that inspired the creation of a Brazilian power? Pull out the pen and paper, because a few of these might came in handy at your next pub quiz. The image of a moustachioed man, wearing a flat cap and button-up striped shirt that includes a St George's Cross embossed on his breast flutters in the southern stand of the 80,000-capacity San Siro Stadium in Milan. Pictured is English emigrant Kilpin, a textile worker and football obsessive from the 19th century that would go on to help shape the game in Italy and form part of its very fabric - in fact, he designed AC Milan's shirt and is said to have decided on their look by saying "our colours will be red like flames, and black like our opponents' fear". As a player, he helped the club win three championships. Kilpin died in 1916, aged 46, and his grave was believed lost until a historian tracked it down. In 1999, AC Milan paid for a new tombstone at Cimitero Maggiore in Milan. However, in Nottingham he remained relatively unknown until years later. Robert Nieri, a Nottingham local, has been at the forefront of raising awareness of Kilpin in the city of his birth - writing a book, fundraising for the shop-front tribute and helping produce a film. "Until very recently, he was a prophet unknown in his home city but now that has changed," said Nieri. "Kilpin should be celebrated in his home city because of his contribution to the development of Italian football and the founding of one of the world's most iconic teams. "He wasn't good enough to play for Nottingham Forest or Notts County, so founded AC Milan. He wasn't playing at a professional level but he is regarded as the father of Italian football, bringing the game to a nation which has won the World Cup on four occasions, in marked contrast to England's solitary victory in 1966. "Kilpin is revered as an icon by the diehard AC Milan fans on the Curva Sud at the San Siro Stadium. He is the reason why the club is AC 'Milan' not 'Milano', why their crest includes the St George's Cross and why they wear red and black stripes - red for the devil, and black to instil fear into the hearts of their opponents." While Kilpin was turning parts of Milan red and black, Nottingham is also the original source of another famous striped Italian ensemble. When Italian giants Juventus marked the opening of their new stadium in 2011, they chose to play against then League One side Notts County. Why? Well, because Notts are the very reason that Juve wear black and white, rather than pink. In 1903, John Savage, an Englishman playing for Juventus, arranged for replacement shirts to be sent to the Turin club - as their pink number was fading in the wash - so he got in touch with a County-supporting friend back home. As a result, the club known as the 'Old Lady' adopted the black and white stripes of Notts County. Now, 114 years later, those colours are still flying high in Italian football as Juventus have won six successive Serie A titles, while Notts County are parked in League Two - the fourth division of English football. Looking further down England's football pyramid, there is a club that not only gave a European giant its famous look, but it spawned a club in its own name almost 5,000 miles away in South America. In the eighth step, playing in the southern division of the Isthmian League, are Corinthian-Casuals - a club largely credited for popularising football around the world as a touring side. This is the South London amateur team that inflicted the heaviest ever defeat on Manchester United and is the only team to ever supply an entire England XI - and they did that twice! Corinthian, as they were known before merging with another amateur club in 1939, helped bring Brazilian football to life on their tour of 1910, impressing spectators so much in Sao Paulo that locals founded a club by the very same name. 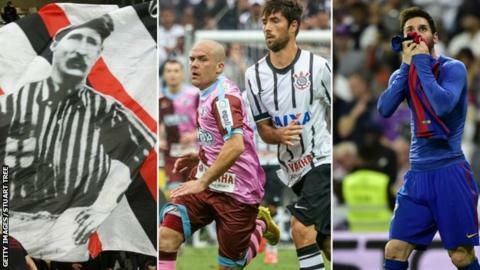 Then, 102 years later, Corinthians Paulista beat Chelsea to become World Club champions. The link between the two Corinthian sides has not been lost either. They have shared players, with Brazilian international legend Socrates lining-up in Corinthian-Casuals' chocolate and pink kit in 1988, and the clubs even share fans, as Brazilian supporters visit the non-league team's King George's Field home ground in Tolworth on a regular basis. In 2015, to mark 100 years since a scheduled match between the two teams was abandoned because of the outbreak of the First World War, the English side were invited to play a friendly match at the Corinthians Arena - the 48,000-seater stadium that just months earlier hosted the opening game of the 2014 World Cup. Stuart Tree, who chronicled that trip as a photographer and who also looks after the club's media, is accustomed to their particular popularity in Brazil - where you can even buy merchandise for the non-league side through the Sao Paulo club's shop. "It's insane, really, when you have fans coming 5,000 miles from Brazil to visit us. They revere our ground like it was Wembley," he said. "I remember setting up the club Facebook page and one day it just exploded. We have 148,000 followers when other clubs in the eighth tier have around 500 or 600." Shaping Brazilian football is not their only claim to international club fame. Closer to home, they are also credited for being the reason that Real Madrid wear white. Corinthian, in their original guise, wore white and such was the style and grace in which they played that Real adopted their strip and endeavoured to emulate the gentlemen amateurs from England. While Real Madrid took their colours from what can be described as the game's original 'Galacticos', their great rivals FC Barcelona sourced theirs from a rugby team at a school in England's north west. The Witty brothers, Arthur and Ernest, were both students at Merchant Taylors' School in Crosby, Liverpool, whose rugby team played in maroon and blue. Both went on to be heavily involved in the early years at Barca - with Arthur captaining the side alongside founder Joan Gamper before going on to serve as president. The club trace the history of their colours to the brothers and "supports the theory", as they were both present at the meeting on 13 December 1899, the moment the blue and red colours were decided upon. Fredrick, son of Arthur, wrote to the headmaster of the school in 1975 to try to verify the tale which has been passed on to him. The Rev. H. M. Luft wrote back to say: "I think it is very likely that the present colours of the Barcelona Football Club (maroon and blue) are ultimately derived from the original colours here. "You are probably completely right that your father and uncle, together, transferred the original colours of our club to Barcelona when they founded the football club there. It is also likely in the late 1880s that there was no such colour as maroon and that it was probably called dark red." Merchant Taylors' say there is plenty of support for local clubs Liverpool, Everton and even Manchester United among their students, but say Barcelona are also embraced as "they are very proud of their historic relationship".